From tip calculator to full blown business phone -- they grow up so fast. 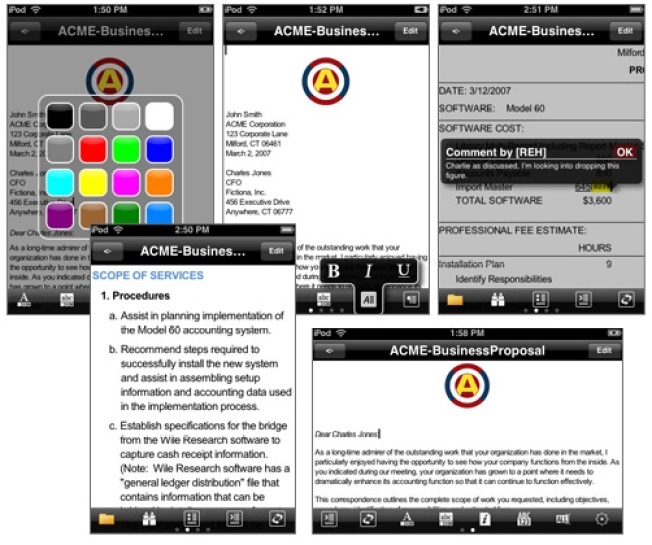 DataViz announced their "Documents To Go" software is in the final stages of completion -- allowing the iPhone to graduate from business school with Blackberry honors. The software allows users to view and edit Word, Excel, Powerpoint and PDF documents. While it has been available on other Smartphones, this will be the first iPhone application to allow such functionality. And for the best news: word on the street is it will also include the much desired cut, copy and paste feature (It's about time). The software was demonstrated in Barcelona for the GSMA Mobile World Congress, the world's largest mobile exhibition and should be released in the second quarter of 2009. A version for Google’s Android phone is rumored to be in the distant future as well.